Nestled in the middle of Hare Lane, this lively salon has a real community feel. Voted “Best for Hair & Beauty” in the Elmbridge Retailer of the Year Awards 2014. Shannelle is fantastic. She listened to what I wanted and produced an amazing colour to my hair. She blowed dried and curled it off. It was amazing. Thanks Shannelle. Absolutely will recommend her. Thank you for taking the time to leave your feedback. I am pleased to hear you received outstanding service from Lindsey and the team. I will pass your comments on to them. 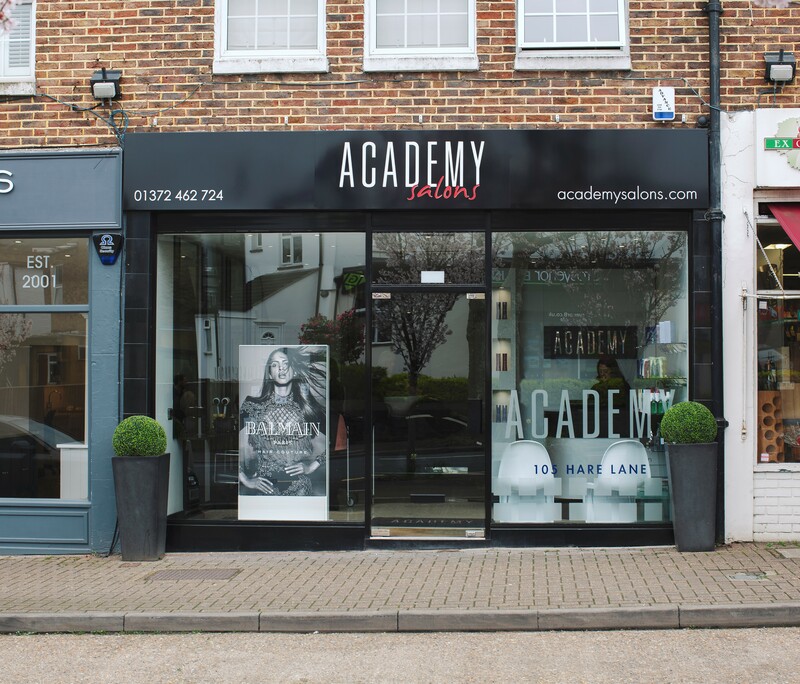 We look forward to welcoming you back to Academy Salons Claygate soon. Coral done an absolutely brilliant haircut and wash on me i was so pleased. She was very quick and efficient and done a perfect job. Looking forward to coming here next time! Thank you so much for taking the time to leave your feedback. I am pleased to hear you were happy with your wash & haircut with Coral. I’ll be sure to pass your comments on to the team. Thank you for taking the time to leave your feedback. I am pleased to hear you love the way Georgia blow dry's your hair and that you had another good salon experience. I’ll be sure to pass your comments on to the team. Never have I found a haven that I can go where the girls are always so welcoming and a hairdresser that does exactly what I wanted every single time! Thank you for taking the time to leave your feedback. I am pleased to hear you continue to enjoy the salon experience and that Sade consistently gives you the look you are after. I’ll be sure to pass your comments on to the team. Thank you for taking the time to leave your feedback. I am pleased to hear you had a good salon experience and that Sade looked after your needs. I’ll be sure to pass your comments on to the team. Coral took gave a lot of her time to get me what I wanted. Thank you so much for taking the time to leave your feedback. I am pleased to hear you had a good salon experience and that you liked your haircut created by Coral. I’ll be sure to pass your comments on to the team. Thank you for taking the time to leave your feedback. I am pleased to hear you were happy with your childs haircut created by Georgia and that she felt at ease. I’ll be sure to pass your comments on to the team. Thank you for taking the time to leave your feedback. I am pleased to hear you enjoyed your wash & blow dry with Coral. I’ll be sure to pass your comments on to the team. Thank you for your feedback. I am pleased to hear you received great efficient service from Georgia. I’ll be sure to pass your comments on to the team. Another fabulous cut & colour by Coral - thanks very much! Thank you for your feedback. I am pleased to hear you enjoyed the service and your cut & colour by Coral. I’ll pass your comments on to the team. Thank you so much for taking the time to leave your feedback. I am pleased to hear you like your hair colour & cut and that you consistently receive excellent service from Christine and the team. I’ll be sure to pass your comments on to the team. Always enjoy coming in to get my hair done with Coral. Thank you for taking the time to leave your feedback. I am pleased to hear you always enjoy getting your hair done with Coral. I’ll be sure to pass your comments on to the team. Thank you for taking the time to leave your wonderful feedback on Sade. I am pleased to hear you like your hair colour and blow dry. I’ll be sure to pass your comments on to the team. I've been a client of Christine for a few years now and know I'm in safe hands. Christine is friendly, efficient and skilled at cutting my (short bob) hair. The other staff are similarly welcoming and professional, the salon itself is always spotless and the playlist is the right blend of upbeat but not irritating. Would highly recommend. Thank you so much for taking the time to leave your review. I am pleased to hear that Christine continues to cut and style your hair how you like it and that you enjoy the salon experience. I’ll be sure to pass your comments on to the team. I have short hair and Georgia always cuts it really well! Thank you for taking the time to leave your feedback. I am pleased to hear Georgia continues to cut your hair just how you like it. I’ll be sure to pass your comments on to the team. Thank you very much for taking the time to leave your feedback. I am pleased to hear you had a good salon experience and that you are really happy with your hair created by Coral. I’ll be sure to pass your comments on to the team. Thank you for taking the time to leave your review. I am pleased to hear you received great service and that you had a good salon experience. I’ll be sure to pass your comments on to the team.